This stunning non-firing replica is a reproduction Western type Navy Revolver. 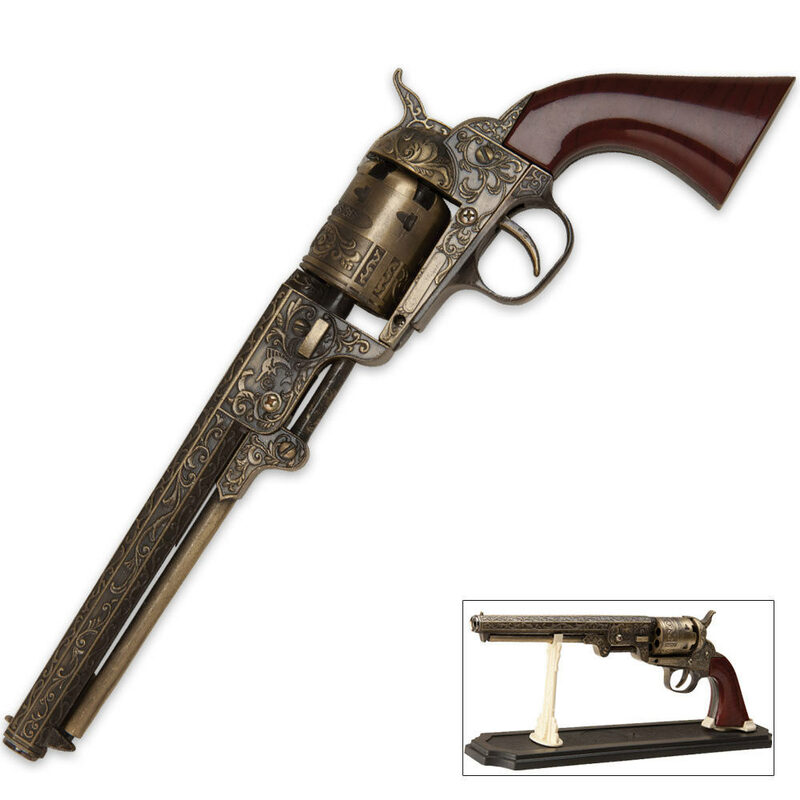 This is a replica of the famous .36 caliber black powder revolver. Constructed of steel with an ornately designed barrel, this piece is a real head turner. This revolver also features a hammer mechanism that can be locked back and released by the trigger. Includes display stand. 13 in. overall. I ordered two of these pistols and am happy I did. Although I wish the cylinder would turn as a real pistol would,overall I'm pleased. So i've always wanted a replica "colt" from the tv show supernatural. And for this price this is the perfect one to do this project to. Very nice display piece. Admittedly the stand looks cheesy. Easy fix, can of flat black spray paint. Eye candy at a modest price! It is a great piece for what one pays for. It is strictly for show. The heavy weight clearly rules this out as a "toy gun." It's an eye catching piece that always strikes up nolstalgia based comments. The gun is mostly metal, looks cool, and is nice and heavy. cons: cylinder turns by hand hammer strike is weak trigger is weak I've had the gun for two days and one of the grips has already broken and I have no idea how to replace it. I bought this for a costume I'm working on. Look, it's a $25 replica so you're not going to be putting this under glass. It's meant to be held and played with, for lack of a better term. The holder is a glossy black plastic with two faux ivory holders for the gun. It's really nice and eye catching across a room. Weight is good, I was able to do some handling tricks/spins with ease. The handle is plastic made to look like eurethaned wood, but again, you don't really notice until up close. At the end of the day, this is a great gift for someone's mancave or for a wild west kid, or as I stated, a costume. If you're looking at this as, say, a decoration for a restaurant or home office, it's a great discount item. My only concerns/disappointments are that the only moving parts are the trigger, hammer, and the barrel only rotates i.e. you can't simluate "reloading". Also, the MADE IN CHINA label is a bit noticeable when in hand, but you can file it off. Or buy American. So to sum up, if you want a cheap display piece, or a replica you intend to handle, this is it. Not a toy for small children, but the 12 & up age will enjoy it as a decoration they can handle and admire while respecting our firearm heritage. Love the construction is this replica. The only two things I'm not loving is the stand and the cylinder won't turn as you pull the trigger. But overall, this is a must have for every gun replica collector. This is the first replica I have in guns. I bought a display case from Joanne's and it fits perfectly. Too much plastic and the white plastic stand is offensive to the eye for a perfect display. I suppose I could paint the white plastic black to make it look like metal. I have a collection of knives and swords but we opted to display this on our mantle in the living room instead of with those collections.